Let Hire Fitness advise on the best gym equipment for your school or educational facility. We'll design a state-of-the-art gym for your pupils and staff, we'll install the equipment for you and we'll even advise on how to safely manage your new gym on a day to day basis. Happy, healthy pupils achieve great things. And with pre-approved funding for every secondary level school in the UK, of up to £250,000, what's stopping you? Shockingly, there has been a huge increase in the number of children and teenagers being admitted to hospital with obesity related conditions over the last decade in the UK. It's thought that the UK has the highest rate of childhood obesity in Western Europe which it's estimated costs the NHS a staggering £4.2 billion a year. Some might say that technology is to blame as our children spend more and more time in front of a computer or video game and less time running around outside with friends. Others think diet is to blame with the huge increase in fast food facilities in the UK and some clever advertising promoting an idyllic lifestyle. The solution therefore is twofold: it's imperative that we educate our children from a young age about healthy eating and how to maintain a balanced diet. It's also about ensuring our children have regular exercise throughout their childhood. Government guidelines recommend that children aged between 5 and 18 should do at least one hour of aerobic and strength exercise every day to help minimise the risk of health issues later in life. So how can school gyms help reduce childhood obesity? Research has shown that children who are fit, tend to achieve better academic results than those who are less active. It's said that 30 minutes of exercise a day results in improved academic performance. Research also suggests that children who regularly exercise have more confidence, better self-esteem and lower anxiety levels and exercise means they're better able to cope with stress. School gyms are increasingly the answer to our obesity problem in this country. Children can get exercise in all sorts of way from walking to school to running in the playground but having structured sessions in a gym during the school day, helps to stimulate a life long interest in fitness and wellbeing. We have recently become approved suppliers working with the Redgrave Legacy Fund with Investec Education. This programme for improving sports and leisure facilities in schools encourages increased participation in sport via the unique funding model held by Investec. Every secondary level school in the UK has been pre-approved to £250,000 for updating and extending their current sports provisions. With our extensive knowledge of the fitness industry and advice and guidance from the Redgrave Legacy, our children can expect a better quality of sporting facilities in schools. Can Hire Fitness design, install and advise on how to manage our school gym? We have 13 years experience of designing and installing school gyms, we've advised on the day to day management and maintained and serviced fitness facilities on a regular basis. Our level of involvement depends entirely upon your requirements; we can be involved at any stage of your project, or from the start to completion and beyond. Apart from our years of experience and expertise within the industry we also have state-of-the-art design software to provide a comprehensive design service to ensure you achieve the best possible school gym in the space you have available. 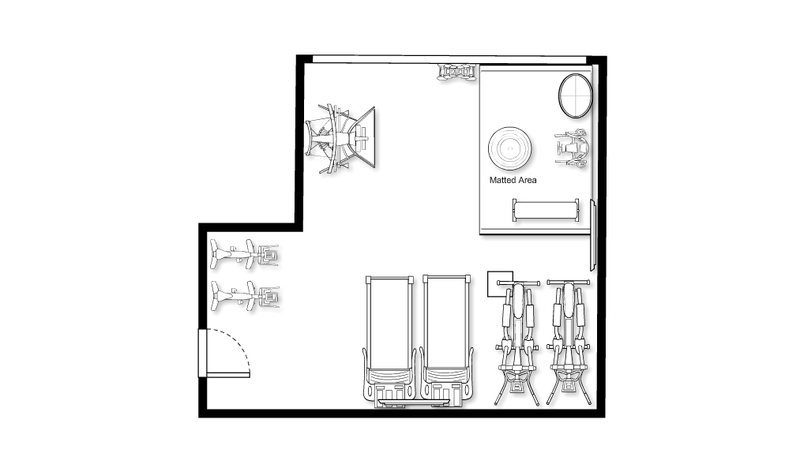 How much and what type of fitness equipment will we need for our school gym? Before you embark on a school gym, it's important to think about the number of users that are likely to use the gym at any one time and what type of equipment will best suit their needs. Space is another consideration but we can advise on all of this for you. We can provide you with a number of funding options to finance your school gym facility including monthly hire, standard lease which is typically spread over 3 - 5 years or purchase. We work with a range of finance partners who will assist you. • Cardio: This type of equipment is the core of any gym setting. It will include treadmills, elliptical cross trainers, exercise bikes and rowing machines. • Mats and Accessories: If space allows, a matted area is useful to allow students to warm up and cool down before and after exercising and also to incorporate stretching and floor exercises into their fitness routine. We have a great range of fun and colourful fitness accessories to help maintain motivation. • Strength and Endurance: We have a range of colourful handheld weights suitable for children/teenagers along with gym balls and other accessories. Apart from the fitness equipment, what else might we need? Can Hire Fitness advise on Health and Safety? Can Hire Fitness provide a comprehensive after sales service? We can provide a comprehensive after sales package including regular planned maintenance and servicing to suit your requirements.